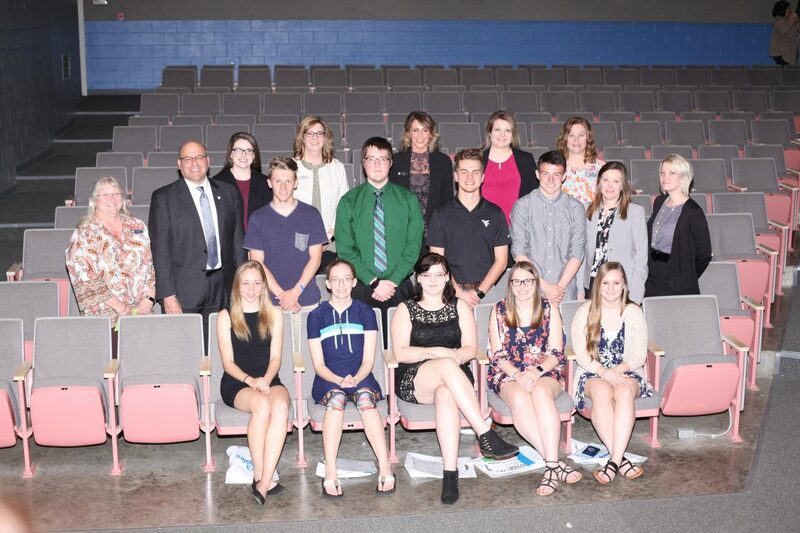 “Never stop raising your personal bar,” Peoples Bank Senior Vice President and Director of Risk Management Ann Helmick urged students being honored Tuesday, during the 41st annual Tyler County and Paden City Schools Academic Awards Ceremony. Sponsored by Peoples Bank, the annual ceremony honors top students in grades 5-12 who attend school in Tyler County and Paden City. The highlight of each year’s event is honoring high school seniors who have qualified for it every year they were eligible. They are recognized on Academic Hall of Fame plaques displayed in their schools. This year’s Hall of Fame honorees were Nicholas Gorby, Emily Jackson, Emily Litten, Destry Nelson, Katie Pratt, Noah Smith, Alaina Thompson and Miranda Weekley of Tyer Consolidated High School, and Hannah Loy and Matthew Rexroad of Paden City High School. One of them — Alaina Thompson — took home a $1,000 scholarship from Peoples Bank. She was chosen in a drawing among the Honor Roll achievers. Master of ceremonies for the two-evening event, held at Tyler Consolidated High School, was J. Michael Myer, executive editor of the Wheeling News-Register and The Intelligencer. During the ceremony for students in grades 5-8, the invocation was given by Amos Kimble, of A.I. Boreman Elementary School. Entertainment was provided by the Tyler Consolidated High School Jazz Band, under the direction of Matt Jennings. During the event for those in grades 9-12, the invocation was by Matthew Rexroad, of Paden City High School. Entertainment was by the Tyler Consolidated High School Choir, under the direction of Bryce Negie. Certificates honoring the students were presented by Tina Bell, manager of the bank’s Sistersville branch, and April Pierce, manager of the New Martinsvillle branch. Honored guests recognized during the ceremonies included West Virginia House of Delegates member David Kelly, R-Tyler; retiring Tyler County schools Superintendent Robin Daquilante, Tyler County Board of Education member and former principal Jimmy Wyatt, retired principal Lynn Caseman, Tyler County Commissioner Eric Vincent, and Barbara Vincent. Vincent was an official of the old First Federal Savings and Loan, which founded the awards ceremonies many years ago. 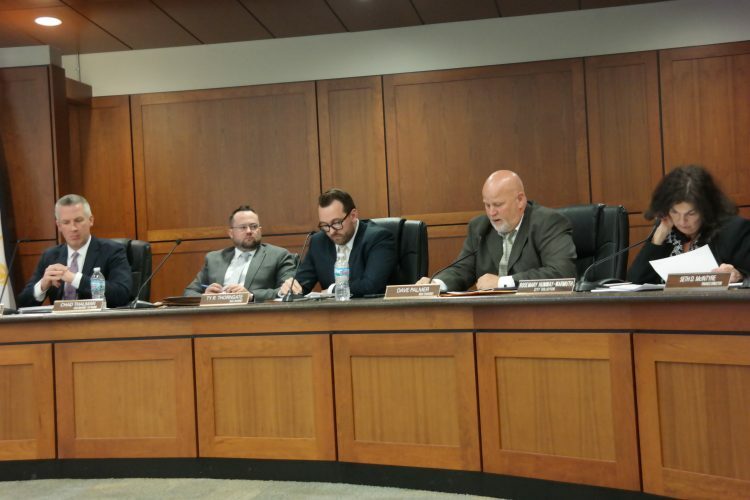 Myer singled out two Tyler County school employees, Director of Child Nutrition, Support Services and Safety Amanda Kimble and secretary Marsha Riffle, noting that the event “simply wouldn’t happen” with out their work. Representatives of the bank, in addition to those noted above, who were recognized included Assistant Vice President for Business Banking Savannah Jeffers, Personal Lines Insurance Producer Marci Davis, Sistersville branch Universal Banker Olivia Osborn and CSR Supervisor Bobbin Pardine; and New Martinsville Universal Banker Rebecca Gill. Deseree Brown, Keith Doyle, Emily Fetty, Lily Haught, Parker Hayes, Ryland Henderson, Wyatt Keller, Amos Kimble, Sawyer Kunkel, Cora Lough, Isabella Murray, Phranki Myers, Dane Nelson, Bryce Nichols, Graci Rader, Hevyn Thomas, Lily Thompson, Kayden Utt, Keyonna Weber. Haven Anderson, Caroline Green, Jessup Higgins, Shandi Lively, Ashton Wade. Riley Blake, Akira Burchard, Aiyanna Higgins, MacKenzie Simpkins. Nicholas Ashworth, Gabrielle Dill, Kathryn Grimm, Arianna Hartline, Dalton Hayes, Kyra Nolan, Nadia Turner, Mckenzie Utt. Farrah Beasley, Isaac Beverlin, Talan Chambers, Ava Giovinazzo, Rayna Smith, Madylen Still, Carlee Sweeney, Jeremiah Thomas. Liam Clements, Faith Duncan, Jaslyn Harn, Alyssa James, Malaree Kline, Tanley McEldowney, William McGinnis, Isabella Snider, McKenzie Thomas. Alec Chaplin, Brandon Hizer, Gavin Lewis, Hallie McDonald, Jasup Spragg. Kelsey Michael, Isaac Neff, Rachel Price, Maggi Still, Hope Weber, Mallory Yeater. Cora Anderson, Isabella Beverlin, Cameron Dennis, Anya Glover, Caleb Howell, Abbe Stackpole. Hope Cooper, Delainey Lantz, Hannah Loy, Matthew Michael, Matthew Rexroad. Donald Benefiel, Chelsey Cooper, Mia Crawford, Jaden Ebert, Abigail Eddy, Aislinn Franks, Belladolce Garuccio, Wesley Glover, Ava Gorrell, Gabriel Jackson, Isaac Jackson, Alexis Livingston, Cole Moore, Colby Nichols, Lexus Rocchio, Beau Thomas, Trenton Webster, William Wirth. Shane Bates, Sydney Deaton, Zoe Hamilton, Kaylee Haught, Ashton Jackson, Jacob Lancaster, Hayden Montgomery, Landon Morse, Erin Riffle, Chance Rine, Braeden Wall, Maleah Weber, Owen Westbrook, Layla Williamson. Larissa Ahouse, Lea Ahouse, Justin Barker, Charles Brown, Leah Cathers, Wesley Drake, Emily Ebert, Garrett Freeland, Bruce Garuccio, Carson Gorby, Emily Gorby, Jesse Griffith, Dylan Grimm, Caitlyn Hayes, Christopher Hayes, Jayden Helmick, Walker Hoover, Trenton Huffman, Gwendolyn Jacenkiw, Trinity Kanz, Abbigail Kimble, Leah Loudin, Madison Lovejoy, Maeson Maxwell, Sierra Morris, Mason Nichols, Kaci Shanabarger, Autumn Shepherd, Austin VanCamp, Ty Walton, Brooklyn Wayne, Mallory Westbrook, Evan Wise. Garrett Ammons, Madeline Cecil, Jamie Daugherty, Audrey Dennis, Jocelyn Foltz, Kate Gorrell, Alissa Greathouse, Emma Grimes, Ayden Hoover, Abigail Ice, Dakota Jones, Avery Kemp, Caleigh Phillips, Jordyn Potoczny, Shauna Riggs, Hannah Shreves, Madeline Tarnecki, Briann Templeton, Ardynn Weekley, Madison White, Victoria Yost. Abigail Barnhart, Hadyn Brown, Haley Cremona, Abigail Ebert, Alexis Huffman, Madeline Ice, Hailey Lane, Sebastian Logemann, Isaac Melvin, Sadie Nichols, Mackenzie Perine, Hallie Placer, Matthew Riddle, Regan Smith, Sydney Smith, Katelyn Stillwagoner, Abigail Thompson. Creed Ammons, Samantha Barnhart, Hailey Cook, Madison DeVaughn, Anna Griffith, Anna Grimes, Rachal Hashman, Sarah Hashman, Alexis Helmick, Kaytlyn Henthorn, Logan Jackson, Shawn Jones, Shiann Jones, George Kester, Garrett Littell, Ashlyn Miller, Katie Miller, Kimberly Owens, Nachelle Probst, Amie Robinson, Jacob Sharp, Nicholas Spencer, Benjamin Stackpole, James Tanner, Rachel Thomas, Judah Turner, Avery West, Hali Westcott. Nathan Barker, Grace Betts, Tori Cremona, Haley Fletcher, Nicholas Gorby, Katlyn Griffey, Cora Grimm, Michael Hogue, Emily Jackson, Josey Jones, Trey Keys, Peyton Kocher, Emily Litten, Cia Loy, Hattie Murphy, Destry Nelson, Griffin Phillips, Haiden Placer, Katie Pratt, Garry D. Seckman, Noah Smith, Sabrina Smith, Kassidy Starkey, David Stoller, Lindsay Streets, George Tennant, Alaina Thompson, Marie Vandruff, Megan Vandruff, Brianna Wade, Jolee Walton, Miranda Weekley, Brandon Wise, Sierra Wright.